In the hundred years since the birth of Sri Sri Paramahansa Yoganandaji, this beloved world teacher has come to be recognised as one of the greatest emissaries to the West of India's ancient wisdom. His life and teachings continue to be a source of light and inspiration to people of all races, cultures, and creeds. On March 7, 1952, the great guru entered mahasamadhi, a God‑illumined master’s conscious exit from the body at the time of physical death. He had just finished giving a short speech at a banquet honouring India’s ambassador to the United States, Dr Binay R. Sen, at the Biltmore Hotel in Los Angeles. 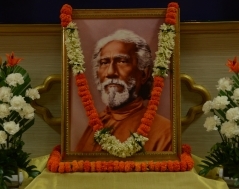 The Mahasamadhi anniversary of Gurudeva is commemorated on March 7 every year, through various programmes across YSS ashrams and meditation centres in India. Commemoration programmes were held at YSS Noida Ashram, Gurugram and Delhi Kendras on this occasion. 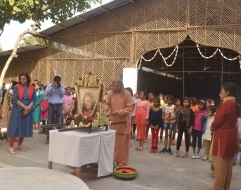 On the evening of March 7, 2019, the commemoration programme was held at YSS Noida Ashram. It included group meditation, satsanga and pushpanjali. 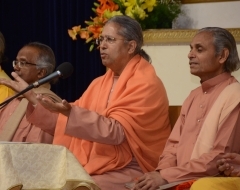 Swami Smaranananda began the programme with a prayer and a cosmic chant, followed by an hour-long group meditation. In the satsanga that followed, Swami Smaranananda gave a powerful discourse befitting the occasion. He said that Gurudeva being omnipresent, is present at the Kutastha of each devotee. Hence, the physical presence of Guruji is not essential. His teachings are eternal and so is His consciousness. In the satsanga that followed, Swami Smaranananda said that Gurudeva being omnipresent, is present at the Kutastha of each devotee. Hence, the physical presence of Guruji is not essential. He said that his present-day devotees may be more fortunate than the ones who merely saw him physically because they are more benefitted by proper attunement with the Guru through following his teachings. Devotees offered pushpanjali at the altar while singing kirtans led by Swami Vasudevananda. 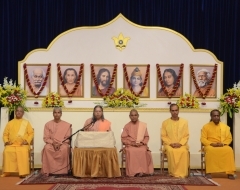 The programme was attended by 200 devotees who felt uplifted by the group meditation, spiritual discourse and kritan. They received halwa prasad from Swami Smaranananda. On the occasion of the Mahasamadhi Divas of Guruji, devotees led group meditation and pushpanjali on March 7 evening at YSS Gurugram Kendra. The programme was attended by more than 60 devotees. Later, on the morning of March 10, a commemorative programme was conducted by Brahmachari Sheelananda at Gurugram Kendra.